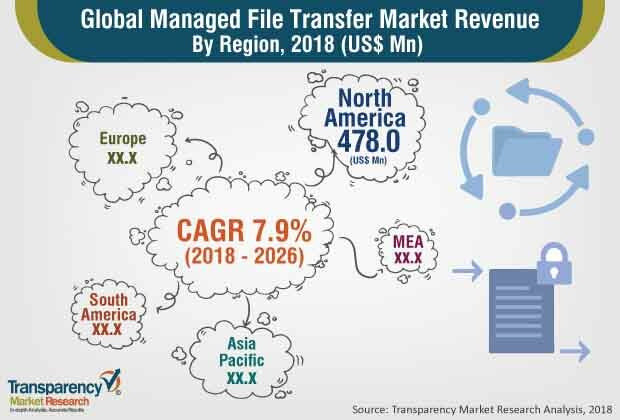 According to a new market report published by Transparency Market Research, the global managed file transfer market was valued at US$ 1,093.5 Mn in 2016 and is expected to expand at a CAGR of 7.9% from 2018 to 2026, reaching US$ 2,307.8 Mn by the end of the forecast period. According to the report, North America was the most significant contributor in terms of revenue to the managed file transfer market in 2016. The need for sharing files between multiple companies and systems has become critical for all enterprises. At the same time, file types, size, and volume are increasing at a rapid rate; hence, traditional sharing methods such as email are not very helpful. Moreover, the exchange of large sensitive files, healthcare records, financial reports, etc., has become common in enterprises. This transfer brings high-security risks, especially if using FTP, email, or other insecure transport options. These problems are solved with the help of managed file transfer solutions. Various rules and regulations have emerged in the file transfer market to increase the security and integrity of sensitive data. For instance, Payment Card Industry Data Security Standard (PCI-DSS) for the payment industry, Health Insurance Portability and Accountability Act (HIPAA) for the healthcare industry in the U.S., and EU Data Protection Directive. The global market for managed file transfer is segmented on the basis of deployment, solution, model, enterprise size, industry vertical, and region. Based on deployment, the market has been segmented into cloud, on-premise, and hybrid. In terms of solution, the market is bifurcated into software and professional services. The software solution is further divided into suite and standalone. The standalone solution is further divided into automated file transfer, file integration, file governance, security & encryption, translation, mobile file sharing and collaboration, file storage, advanced workflows and others (file synchronization, file acceleration, etc.). Professional services are sub-segmented into installation and integration, and support and maintenance. Based on model, the market is categorized into person-person, server-person, person-server, and business-business. In terms of enterprise size, the market is fragmented into small & medium enterprises (SMEs) and large enterprises. The market is segmented based on industry vertical into BFSI (Banking, Financial Services and Insurance), IT and telecom, government, healthcare, logistics, education, retail, media and entertainment, manufacturing, energy and utility and others (travel and hospitality, legal, construction, etc.). Geographically, the global managed file transfer market is divided into North America, Asia Pacific, Europe, South America, and Middle East & Africa. In North America, revenue is majorly generated from government and BFSI industry vertical. The growth of the market in North America is due to the presence of influential players such as IBM Corporation, Oracle Corporation, and Open Text Corporation in the region. The market in the Asia Pacific region is expected to register the highest growth due to growth in digitalization and industrialization. The markets in Middle East & Africa and South Africa are anticipated to grow at a slow rate due to lack of awareness about managed file transfer solutions. The global managed file transfer market is highly competitive. The market includes key players such as IBM Corporation, Tibco Software Inc., Oracle Corporation, Linoma Software, Ipswitch Inc., Open Text Corporation, GlobalSCAPE Inc., Attunity Ltd., Biscom Inc., Axway Software SA, JScape LLC, Seeburger AG, South River Technologies Inc., and Cleo Communications Inc.